“For the first time since kindergarten, I will have to learn how to go to class again.” That is what Freed-Hardeman University prospective student Katie Scott said when she was told about iKnow 2.0, the initiative created by the university to shift the paradigm of traditional instruction at FHU. Beginning in the fall of 2012, iKnow 2.0 will provide an iPad to every student who enrolls as a freshman at Freed-Hardeman University as well as every faculty member at the institution. iKnow 2.0 will provide an iPad to all freshmen beginning with the Fall 2012 cohort. In addition, FHU will establish minimum MacBook requirements for incoming freshmen. It is anticipated that continuing and transfer students will be provided an opportunity to opt in to the iKnow 2.0 program and receive an iPad for a one-time fee that is basically equivalent to the cost of the iPad. The most exciting part of the program will be the ability to access textbooks via the iPad. Historically, students go to the university bookstore and spend hundreds of dollars per semester on books. Now, because of the iPad, students will have access to interactive digital textbooks that are not only more participatory, but significantly more affordable. FHU has partnered with Inkling, a company working with publishers to provide enriched, interactive, and engaging content, on the iPad. Their goal, along with FHU, is not to reinvent the textbook or reinvent publishing, but to reinvent the way people learn on the campus of Freed-Hardeman University. "When I visited the campus and met the team at FHU, it was clear to me that we had a forward-thinking technology partner to work with," said Matt MacInnis, founder and CEO of Inkling. "We're thrilled to be a part of the university's technology revolution." 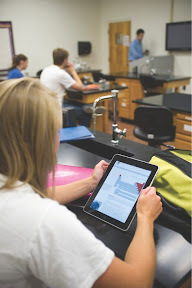 “Once we saw a demo of Inkling, it was obvious how limited traditional textbooks had become and how limitless the digital textbooks seemed on the iPad. That is very exciting for us,” said Mark Scott. Additionally, the iPad will be provided to the faculty of Freed-Hardeman. They also recognize the importance of moving forward. Faculty at FHU believe that will be the case, if they can get the iPad to the classroom. Self-Davis said that when FHU conducted the iPad pilot study that the tablet seemed to be less intrusive than a laptop and definitely more interactive. The iPad does have its challenges, however. Changing the way professors have taught for years, some of them for more than 30 years, is definitely a challenge according to campus information technology specialist Patrick Bolton. “Although we have made great strides over the past several years, we have a few instructors who have yet to embrace new technology,“ said Bolton. “We have to find a way to integrate what they have done for years, what they are comfortable with, into this new technology.” According to Boltin, one way this can be accomplished is by using the iPad in conjunction with a MacBook as a mobile digital white board. Using the software Doceri, allows one to wirelessly control their computer and annotate on Powerpoints and PDF documents. Many of the professors are surprised when they see the ease and capability of the iPad. Lisa Beene, chairperson of the behavioral sciences department, said she was nervous about receiving the iPad, but then impressed. “This is an enormous undertaking for the university and we know there will be challenges and possibly criticism,” said Mark Scott. “But, we have a responsibility to the students to prepare them for employment and to our faculty to help them with that preparation in the best way available. We believe this program to be one of the most progressive in the nation. Our vision is to lead the way in higher education innovation. We plan to continue to build upon the momentum created by our innovation. iKnow 2.0 will not only move toward a greater focus on mobile learning and technology, it will simply make the traditional classroom a thing of the past. We expect to enhance instruction and improve student-learning outcomes with our innovation. This program will allow us to continue that journey toward effective, relevant, and transparent use of technology in learning,” Mark Scott said. In 2008, Freed-Hardeman pioneered integrating technology in the classroom with the iKnow initiative. With the development of mobile technology and the fusion of academics, highly trained faculty and the best students in the Southeast, FHU was repeatedly recognized as the leading technological university within the region and in the Southeast.